Richard Branson- "If I get frustrated by something, then I like to try to put it right." Above all, you want to create something you are proud of…. That has always been my philosophy of business. I can honestly say that I have never gone into any business purely to make money. If that is the sole motive, then I believe you are better off doing nothing. We’d love to be involved with the creation of something very special, something quite large and something quite exciting. I was never, ever interested in becoming a businessman or an entrepreneur. To be successful, you have to be out there, you have to hit the ground running, and if you have a good team around you and more than a fair share of luck, you might make something happen. But you certainly can’t guarantee it just by following someone else’s formula. Some 80% of your life is spent working. You want to have fun at home; why shouldn’t you have fun at work? Because I don’t see Virgin as a company but as a way of life and I fully enjoy it, I don’t think I’ll ever retire. As much as you need a strong personality to build a business from scratch, you also must understand the art of delegation. I have to be good at helping people run the individual businesses, and I have to be willing to step back. The company must be set up so it can continue without me. Well, I’m somebody who is just living…living life, and if I get frustrated by something, then I like to try to put it right. Back then we would create a company based on frustration at other people’s service and suddenly realized we had one of the most respected brands in the world. If you get your face and your name out there enough, people will start to recognize you. If I was a businessman, or saw myself as a businessman, I would have never gone into the airline business. In the beginning it was just about the business – now it’s about the brand. If you are trying to do something for the first time, it’s always an enormous challenge, and there is no guarantee of success. You never know with these things when you’re trying something new what can happen. This is all experimental. And obviously, from our own personal point of view, the principal challenge is a personal challenge. All you have in life is your reputation: you may be very rich, but if you lose your good name, then you’ll never be happy. The thought will always lurk at the back of your mind that people don’t trust you. I had never really focused on what a good name meant before, but that night in prison made me understand. I don’t think of work as work and play as play. It’s all living. I had no interest whatsoever in running a company. Well, I think that there’s a very thin dividing line between success and failure. And I think if you start a business without financial backing, you’re likely to go the wrong side of that dividing line. Screw It, Let’s Do It. Many people know the Virgin brand better than the names of the individual companies within the group. Branding is everything. 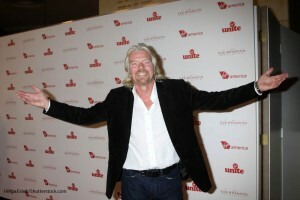 A young girl once came up to me and told me I could be famous because I looked just like Richard Branson! If you’re good with people…and you really care, genuinely care about people then I’m sure we could find a job for you at Virgin. The companies that look after their people are the companies that do really well. I’m sure we’d like a few other attributes, but that would be the most important one. Having a personality of caring about people is important. You can’t be a good leader unless you generally like people. That is how you bring out the best in them. And you know, I’ve had great fun turning quite a lot of different industries on their head and making sure those industries will never be the same again, because Virgin went in and took them on. Fortunately we’re not a public company – we’re a private group of companies, and I can do what I want. I’ve had to create companies that I believe in 100%. These are companies I feel will make a genuine difference. Then I have to be willing to find the time myself to talk about them, promote them and market them. I don’t want to spend my life doing something that I’m not proud of. Clearly in the eyes of the consumer the brand has not been diluted, but we must guard against that happening at all costs. We’re going where no one has gone before. There’s no model to follow, nothing to copy. That is what makes this so exciting. I cannot remember a moment in my life when I have not felt the love of my family. We were a family that would have killed for each other – and we still are. Virgin is already a global brand. Brands like Amazon have had to spend hundreds of millions of pounds you know, building their brands, whereas Virgin is already well-known around the world. I’m inquisitive…. and I love a new challenge… and if I feel that we can do it better than it’s been done by other people, we’ll have a go. Some people call that ‘brand stretching’ and say that this is not the way business should be done, and in the Western world generally it’s not the way business is done. And I think to be perfectly frank the reason it’s not done that way is that most big companies are public… they have fund managers who only specialise in one area… and so if you go and stray outside that fund manager’s arena, the company gets criticised. Fortunately we’re not a public company – we’re a private group of companies, and I can do what I want. Business is giving people in their lifetime what they need and what they want. And you know, I’ve had great fun turning quite a lot of different industries on their head and making sure those industries will never be the same again, because Virgin went in and took them on. Occasionally we’ll come unstuck and you know, we’ll learn from our mistakes but so far I think we’ve managed to get it right more often than we’ve got it wrong. We’ve got an engaging, edgy, vibrant, fun product, … It may or may not work, but we’re going to give it our best shot. I wanted to be an editor or a journalist, I wasn’t really interested in being an entrepreneur, but I soon found I had to become an entrepreneur in order to keep my magazine going. Ridiculous yachts and private planes and big limousines won’t make people enjoy life more, and it sends out terrible messages to the people who work for them. It would be so much better if that money was spent in Africa – and it’s about getting a balance. So I’ve seen life as one long learning process. And if I see – you know, if I fly on somebody else’s airline and find the experience is not a pleasant one, which it wasn’t in – 21 years ago, then I’d think, well, you know, maybe I can create the kind of airline that I’d like to fly on. The music industry is a strange combination of having real and intangible assets: pop bands are brand names in themselves, and at a given stage in their careers their name alone can practically gaurantee hit records. We, we – as I say, we go in and shake up other industries and I think, you know, we do it differently and I think that industries are not quite the same as a result of Virgin attacking the market. With the casino and the beds, our passengers will have at least two ways to get lucky on one of our flights. shoes to see what could make it better. You never know with these things when you’re trying something new what can happen. This is all experimental. If a chairman of a company visits Seattle, that chairman should take all the staff out in the evening and have a few drinks together, talk together and party together and not be embarrassed about the staff seeing the weaker side of you.